Say it quickly as in "LMNOP." Joan, a friend of ours, had lent Ann this book which languished on her bookshelf until recently, and after Ann finally finished it (actually, a very fast read once one starts), said to me, you ought to read this book as it's "charming." Charming? I want to read a charming book? But she also added that it has its dark moments. OK, why didn't you say "dark" in the first place, bring it on (I was between reading materials anyhow)! Well, she was right on both counts. First it appealed to me right out of the gate as it is an epistolary novel, a favorite form of mine, with Helene Hanff's 84, Charing Cross Road being the best of the lot. I had also read the more recent The Guernsey Literary and Potato Peel Pie Society by Mary Ann Shaffer and Annie Barrows which I would definitely put in the "charming" category. 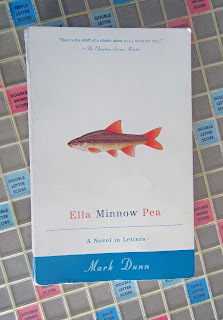 Ella Minnow Pea though is in a league of its own. It is first and foremost a homage to the English language and a subtle statement about its disintegration -- or even increasing irrelevancy (thanks to our substandard educational system and the onslaught of mass media). It almost reads as a word game. It's my second straight read about a fabled place (Saint Sebastian being the other one), in this case Nollop, "an autonomous island nation 23 miles southeast of Charleston, SC" In the 19th century it instituted a "monastic devotion to liberal arts education and scholarship, effectively elevating language to a national art form." The nation was renamed Nollop to honor its "native son, Nevin Nollop, the author of the popular pangram sentence The quick brown fox jumps over the lazy dog". Imagine, a peaceful, harmonic small nation which puts language first, and modern technology second. A cenotaph was erected at the center of town, with tiles of that pangram at top to honor Nevin Nollop, who, over the years, became almost a deity. All was well for years. But the "High Council" -- heretofore a compassionate though bureaucratic government of the island -- elevated Nollop to God himself when the masonry holding the letter "Z" crumbled and the letter fell to the ground. The Council chose to interpret this as Nollop's message from beyond the grave that the letter "Z" was to be banned from all speech and written communication, with severe penalties, even death or expulsion from the island by the third offense. So already, the novel is setting up one of its themes, scientific reasoning vs. religion (the aging of the masonry, the true reason behind the falling tile vs. man's never ending quest to find an explanation for the unknown through religious fanaticism). As more tiles descend, the consequences for the residents of Nollop become more complicated and severe, having to delete now a continuing barrage of the alphabet when they speak or write, with their correspondence now being confiscated and inspected prior to delivery. The Council becomes more dictatorial, instituting totalitarian government to ensure all citizens worship the dictums of the great Nollop from beyond the grave, even seizing private land to erect a church in his name. There are some very funny moments in the novel, and some very sad ones. There are themes such as the role of chance in life, and how one neighbor can turn on the other and then eventually seek forgiveness and receive compassion. And it is all comported in correspondence that becomes increasingly difficult to write as more letters continue to fall to the ground with increasing frequency. There is even some talk of going to a roman numeral form of communication, but, by that time, most of the townspeople have already been banished or worse. Mark Dunn, who is a playwright by trade, has used all his dramatic skills and his love of language to write this work, such a delight to read as he too obeys the will of the almighty Nollop High Council in writing these epistles that are more and more difficult to discern, but still readable. Sometimes, they reminded me of the ubiquitous ad on the NY Subways systems in the 1960's that read something like this: "if u cn rd ths, u cn lrn spdwrtg." If you read LMNOP (i.e. 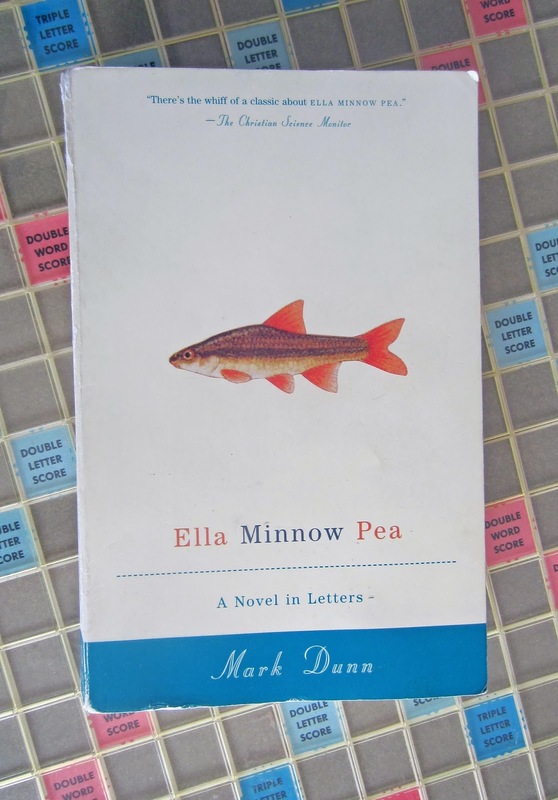 Ella Minnow Pea), you will not put this down as our young heroine Ella tirelessly works on "Enterprise 32," a pangram that promises to end the whole debacle. Thanks, Ann and thanks to Joan, who as I said lent her this work ages ago (it's a signed edition too, as Joan and Michael's PR firm worked with the author on its publication).